Here you can get the latest happenings around the world.Recent news and other current events are updated on this site regularly. Current Affairs updates play an important role in scoring. 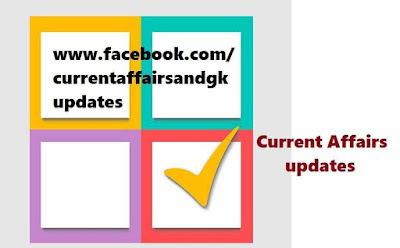 General Awareness section or General studies section in competitive examinations consists of questions on Current Affairs updates and Stock G.K.(General Knowledge).Updates on November 3rd,4th,5th and 6th are covered. The updates in this post are very useful in upcoming recruitment examinations like IBPS, SSC, RRB, SBI,RBI,Postal,Insurance,TSPSC and other state level recruitment tests. 1.Suresh N Patel was appointed as the MD(Managing Director) and CEO(Chief Executive Officer) of Andhra Bank. 2.The 16th National Senior Women's Boxing Championship concluded in Bongaigaon.Nikhat Zareen of Nizamabad District(Telangana State) won gold medal. 3.India has become the world's seventh most valued "nation brand"(Brand Value of USD 2.1 billion).The US remains on top with a valuation of USD 19.7 billion. 4.Economic Affairs Secretary Shaktikanta Das has now joined the board of capital markets regulator SEBI. 5.Sundar Raman,the COO(Chief Operating Officer) of IPL(Indian Premier League) resigned. BCCI accepted his resignation. 6.T S Thakur to be the next Chief Justice of India.Thakur will succeed Justice H L Dattu.He would be the 43rd Chief Justice of India. 7.Ace shooter Jitu Rai won silver medal in 13th Asian Shooting Championship. 8.Hindi has emerged as the largest Indian Language spoken in the United States with 6.5 lakh speakers. 9.SBI(State Bank of India) has announced that P K Gupta will be the new MD (Managing Director) of the bank.He will be handling the portfolio compliance and risk. 10.Sulabh International founder Bindeshwar Pathak finds his name in the inaugural Global Diversity list. 11.Telangana T-Hub,the biggest start-up incubator inaugurated by Ratan Tata and Governor ESL Narasimhan.The incubator is located at the IIIT at Gachibowli,Hyderabad. 12.PM Narendra Modi launched gold monetisation scheme and Sovereign gold bonds that offer 2.75 percent interest to investors to cut physical buying of the precious metal. 13.Narendra Modi also launched first-ever national gold coin minted in India.This coin will have the national emblem on one side and Mahatma Gandhi on the other side.